About an hour and a half plane ride from the Philippine capital Manila is a long, narrow island home to about a quarter of all the animal species found in the country. So unique is this island called Palawan that it hosts two World Heritage sites, the Puerto Princesa Subterranean River in the provincial capital, and the Tubbataha Reef in Cagayancillo. Data from Global Forest Watch (GFW) reveal more than 6 percent of Palawan’s forest cover has been lost since 2001. But as humans raze the island’s extensive forests for development, many animals–including 27 endemic species of birds, 19 varieties of land mammals, and 24 kinds of reptiles–are facing huge population declines. 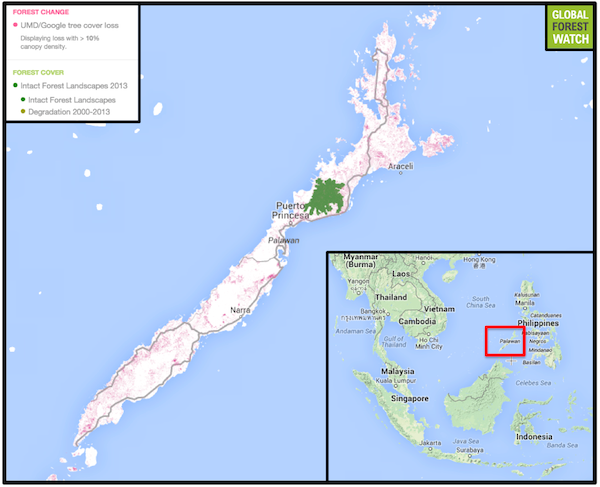 Environmentalists and scientists say the island has many problems: land conversion due to human population increases, logging, and even a huge palm plantation, together with continuous quarrying and mining activities. 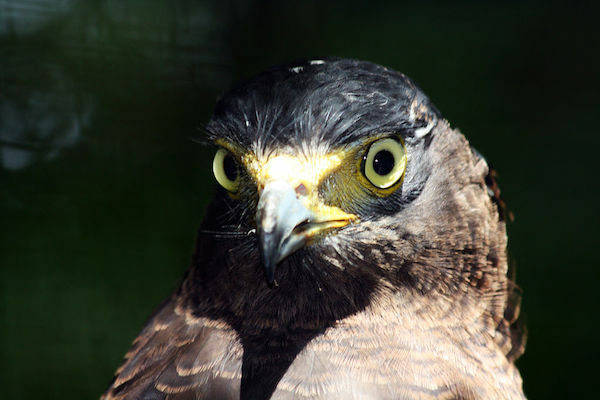 Palawan is home to crested serpent eagles (Spilornis cheela). Photo by Jonah van Beijnen. “It’s just too many people, and more people need more space,” said Dr. Neil Aldrin Mallari, country program director of Fauna & Flora International – Philippines, a London-based environmental organization. The National Statistics Office (NSO) records show that the population in Palawan grew at an annual rate of 2.66 percent from 2000 to 2010. If this rate continues, the population in the province is expected to double in 26 years. Growth is even higher in Puerto Princesa City, whose population increases by 3.24 percent every year. The highest concentration of deforestation has occurred in areas around Roxas, Arceli, Puerto Princesa and Batarasa, according to Mallari. Mallari and his research group also studied forest cover change within the Puerto Princesa Underground River National Park. 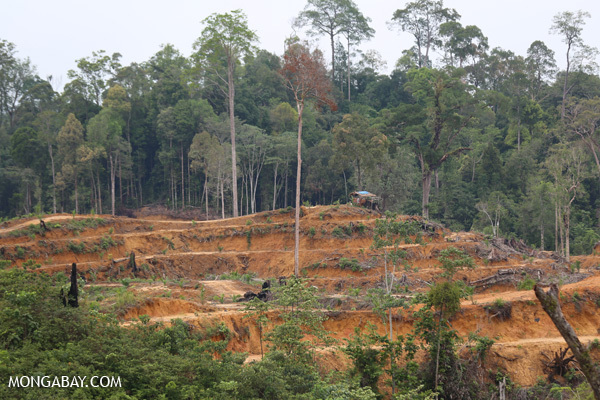 Their paper, published in Environmental Management, showed about 1,500 hectares of forest in the protected area were felled between 2002 and 2007, and the land converted for other uses such as agriculture and residential development. 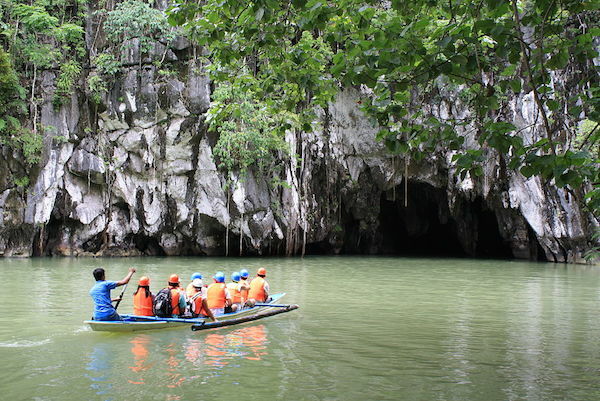 More than 40 years ago, under Proclamation 835, the underground river in Puerto Princesa was declared a national park, highlighting the need for maintenance and conservation of the area’s natural beauty and ecological importance. 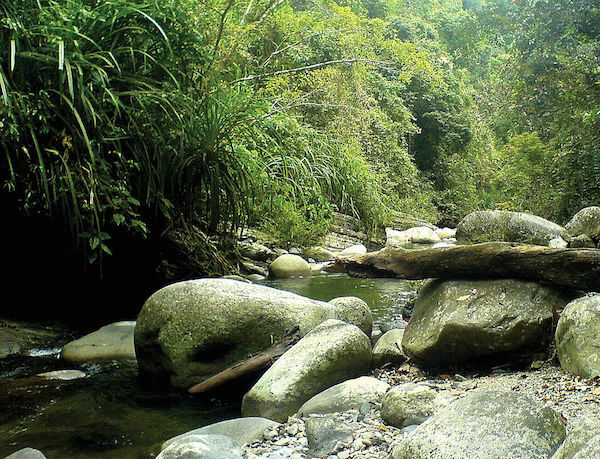 About two-thirds is covered in lush tropical rainforest, which also serves as center of endemism in the province with many species found nowhere else in the world. Visitors approach the entrance to the underground river in Palawan’s Puerto Princesa Subterranean River National Park. Photo by Mike Gonzalez. Mallari’s study also found that if deforestation is rampant in a protected area, the situation could be worse in other parts of Palawan that lack conservation policy. However, all is not bleak. In 1992, a national law called Republic Act 7611 was passed to establish a “Strategic Environmental Plan” for the province, which includes sustainable development of natural resources and promotion of participation of the public, including Palawan’s indigenous communities, in conserving the island’s ecosystems. Rapid population growth is not the sole driving force behind forest cover loss in Palawan. According to a representative from a Palawan-based organization, illegal logging is one of the biggest contributors to forest cover loss. “People living in the mountains still practice slash-and-burn where they cut trees and burn them to make the land available for farming,” said the environmentalist, who asked not to be identified. Elmer Badilla, a Palawan-based journalist, told mongabay.com that deforestation in the southern part of the province results from bark tanning, in which bark harvested of mangroves is used to tan leather. He added that caingin (slash-and-burn clearing), illegal land conversion and charcoal production are also common in northern Palawan. Forest destruction is wrought not only by residents of Palawan, but also by those from neighboring islands. “Migrants from other provinces such as Masbate were also seen to enter the province through boats,” the anonymous environmentalist said. “They, too, are known go to the forests and cut trees. According to the environmentalist, expansion of Palawan’s palm oil industry has also led to significant forest loss. A study by the Stockholm Environmental Institute (SEI), a Swedish research institution found that the first oil palm seedlings were planted in the province in 2007, with harvesting starting in 2011 on a 3,592-hectare tract of land. The palm oil project in Palawan was led by Palawan Palm & Vegetable Oil Mills, Inc. (PPVOMI) (60 percent Singaporean-owned and 40 percent Filipino) and its sister company Agumil Philippines, Inc. (AGPI) (75 percent Filipino-owned and 25 percent Malaysian). The companies possess licenses to cultivate oil palm on at least 15,000 hectares of forest—or about 2 percent of the total land area of Palawan. The SEI study cited instances in which local residents reported oil palm farms affecting forest and coconut groves. 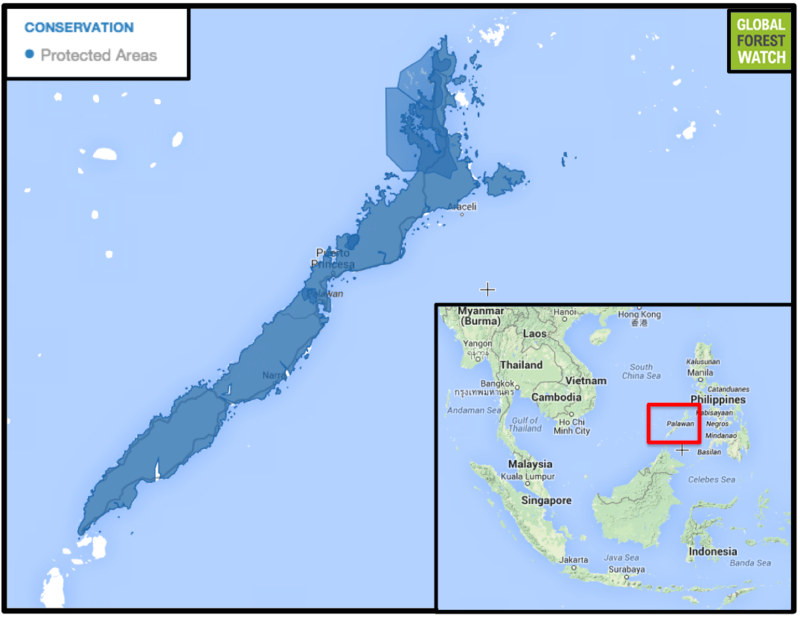 “In the municipalities of Quezon and Rizal alone, the DENR has identified 185.25 hectares of oil palm cultivation in timberland, comprising 35.15 hectares of forested land both outside and inside the Mt Mantalingahan Protected Landscape and 150.1 hectares in Certificate of Ancestral Domain Title (CADT) areas,” the study states. Confronting the issues is a difficult task, according to the anonymous environmentalist. Deforestation for a palm oil plantation in Sumatra, Indonesia. Such practices are starting up in Palawan. Photo by Rhett A. Butler. Mallari, Badilla and the environmentalist agree that mining contributes to deforestation, but it is not the primary culprit. However, while it brings jobs to some residents, unsustainable mining practices may lead to destruction of natural resources. This controversial issue led to the 2011 death of a well-known radio announcer and environmentalist in the Province, Dr. Gerry Ortega. He was gunned down in Puerto Princesa City shortly after his radio program. Prior to his death, Ortega had been receiving death threats because of his anti-mining views. Local journalist Elmer Badilla said that mining is mostly concentrated in the southern tip of the province. One of the more well-known mining companies, Rio Tuba Nickel Mining Corporation has been operating in Bataraza for more than 40 years. “Aside from that, there are also mining sites in the towns of Narra, Brookes Point and Sofronio Espanola,” Badilla said. Philippine President Benigno S. Aquino issued an executive order to stop all pending mining applications in Palawan in 2012. However, all established mining operations in the province were allowed to continue. Among the legally-operating mining sites in Palawan are Coral Bay Nickel Mining Corporation in Bataraza, MacroAsia Mining Corporation in Brooke’s Point, Berong Nickel Corporation in Quezon and the Citinickel Mines and Development Corporation also in Bataraza. “[Mining] may have contributed [to deforestation] but it’s more of just the growing…population in the area,” Mallari said. These human activities added up to more than 64,000 hectares of forest loss in Palawan from 2001 through 2012, according to Global Forest Watch. When compared to the island’s total one million hectares of tree cover, this means 6.4 percent of the province was deforested in just over a decade. However, a small portion of this number may be due to plantation harvesting. Palawan has lost more than 64,000 hectares of tree cover since 2001. Map courtesy of Global Forest Watch. Click to enlarge. 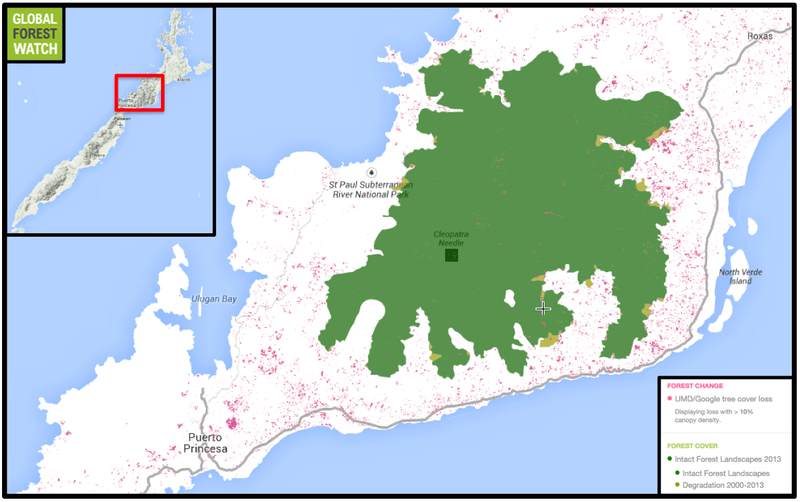 Palawan has experienced significant tree cover loss despite being nearly completely covered in Protected Areas. Map courtesy of Global Forest Watch. Click to enlarge. The edges of Palawan’s last remaining large tract of intact forest have been whittled away since 2000. Map courtesy of Global Forest Watch. Click to enlarge. Land converted for human needs and wants comes at a cost to wildlife that are often killed or displaced when their habitat is cleared. 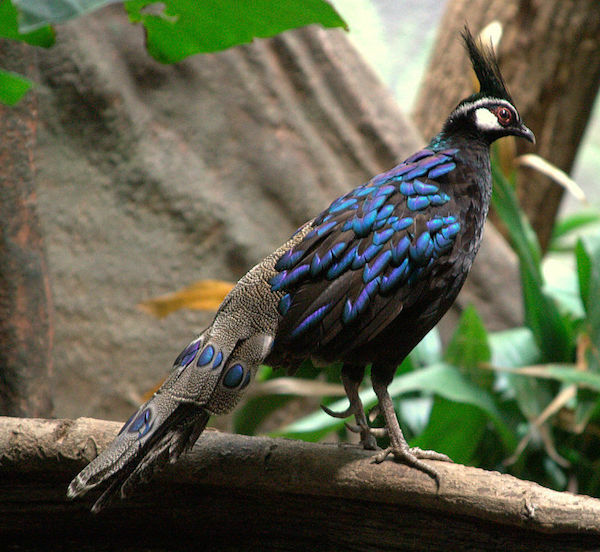 One of the threatened species he identified is the Palawan peacock pheasant (Polyplectron napoleonis). “These species are more vulnerable than we are and they have high fidelity to forest ecosystems. A decrease in their population means a decrease in their habitat,” he told mongabay.com. He said Palawan peacock pheasants and other species of birds that breed during summer cannot adjust easily if they’re displaced by habitat loss, or if the microclimate of the forest changes due to climate change. Mallari also said that aside from the animal species in the forests, humans are also affected by deforestation. A study published in 2012 in the Journal of Geography and Geology found mining-caused deforestation could interfere with groundwater resources and could even make El Nino-induced drought worse in the Philippines.